Jurgen Klopp’s Liverpool just fell short of their first win as Sadio Mané equalised following a Benteke header. The game was fairly balanced throughout with a particularly interesting approach from Klopp which featured a number of changes in shape. The formations at the beginning of the match. The German started off with a 4-3-2-1 shape which he has used in his matches so far in England. Simon Mignolet was the goalkeeper behind an unchanged back four of Moreno, Sakho, Skrtel and Clyne. 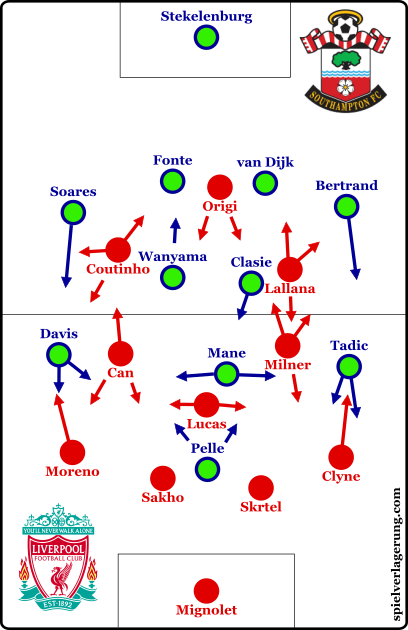 Lucas was the nominated central pivot whilst James Milner and Emre Can were either side of him in more ‘8’ roles. 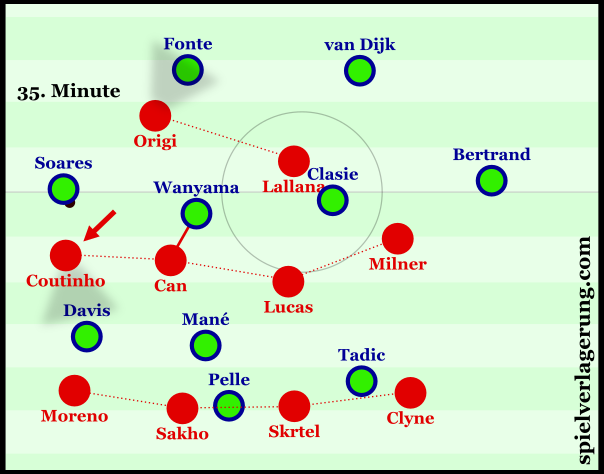 The flexible front ‘3’ consisted of Lallana and Coutinho playing behind Origi, though the trio rotated on a frequent basis. Ronald Koeman brought his side to Anfield with a fairly 4-2-3-1 formation. Maarten Stekelenburg started with Jose Fonte, Virgil van Dijk, Cedric Soares and Ryan Bertrand making up the defensive line. Victor Wanyama and Jordi Clasie made up the double pivot with the Dutchman moving forward more than his African partner. Mané was the central player in the ‘3’ yet made many movements to wide positions where he could combine with one of Steven Davis or Dusan Tadic. Graziano Pelle was the lone striker ahead of the ex-Salzburg forward. Something which will be payed close attention to in his start at Anfield will be the pressing of Liverpool. The German manager is obviously famous for it from his time at Borussia Dortmund and it is clear that he will look to carry this on in Liverpool. Through their narrow 4-3-2-1 shape, Liverpool were shaped quite well to press diagonally and force Southampton away from the valuable central spaces. This was roughly the approach which they took against Tottenham as the Spurs initially struggled to develop possession through the middle. However in a quite unusual approach this was not always the case. Coutinho arcing his run to attack Cedric vertically. As the ball looked to be moving from the centre-back to his near full-back, the ball-near ’10’ would often arch his run to press the full-back vertically as opposed to being on a diagonal line. Meanwhile, the ball-far ’10’ would shift over slightly to semi-cover the space left. The effect this had was that the press was more focused to blocking developments down the wing as opposed to a more-threatening half-space build-up. In addition to this, the movements were understandably not fully harmonic and windows of opportunity opened for diagonal passes between the movements of Lallana and Coutinho. A particularly interesting aspect of this was that it happened much more frequently down Liverpool’s left, suggesting an adaptation to accommodate something spotted in Southampton’s right-sided build-up on the wing. Liverpool’s asymmetrical structure when defending the left. The resulting positional structure which followed these movements was another point as it formed an asymmetrical shape during Southampton’s possession in midfield. Coutinho drops towards a left-midfield position whilst Can becomes the left central-midfielder in a bank of four. Through general inactivity, Lallana stays higher than his attacking-midfield partner to form a lopsided 4-4-2 shape as Origi blocks the return pass to the ball-near centre-back. The structure was relatively stable as Southampton struggled at times to bring the ball back into the centre despite Liverpool’s greater focus on their wing play.With Coutinho and Origi blocking forwards and backwards passes whilst Lallana and Can occupied central spaces there was the potential for traps against the touchline, which were made occasionally. When they pressed centrally with a more standard 4-3-2-1 shape, there were some apparent issues which are inevitable as Klopp develops a weak team. As MR pointed out on Twitter, Klopp has a job on his hands as he has to change a team from being reactive under Rodgers, to one which is proactive in defence; something which will definitely take time. Milner moving away leaves the centre vulnerable. An example of this issue came in the 30th minute. The double ’10’ was beaten and Southampton started moving towards the three midfielders behind them. As the play developed, James Milner made a (likely instinctual) reactionary movement towards Bertrand as if to man-mark him and space between him and Lucas opened up for Saints to use. This situation would’ve been much more stable had Milner taken a proactive approach. An example of this would’ve been to orient him zonally and cover the half-space and inadvertently cover Bertrand with his shadow. This would’ve applied positional pressure on van Dijk and likely forced a pass to a weaker wide position. Another variation would’ve been to drop deeper yet still cover the half-space. This would’ve produced a similar result with potentially more defensive security though without the possibility of intercepting the pass. Attention can also be paid to Can, whose positioning is down to the ball being previously down Southampton’s right, yet he could definitely shift back quicker to provide cover in the open 10 space. With a narrow 4-3-2-1 shape, Liverpool are orientated around the centre and half-spaces in possession – promising. During their build-up of possession, Southampton controlled the central passing lanes quite well which forced Liverpool into wider build-ups however following the initial press, they looked to access the centre and ball-near half-space through diagonal passes. Klopp’s side were quite stable during these wide developments due to the movements of the ball-near midfielders. The closer ‘8’ would often drop into the half-space and offer a pass inside, whilst the near ’10’ could make similar movements depending on his teammate. In some of their worse situations, Lallana or Coutinho (usually the former) would make a run down the line and through insufficient connections, the possession game would break down. Through shifting towards the ball, they generally created a structure which allowed enough connections to move the ball upfield. Although not always fantastic, it was good enough for the Premier League. Once they moved the ball into the half-space during the second phase of possession, they encountered some issues against Southampton’s man-orientated defense and the body position the midfielders received in. With the ball-near 10 often dropping in to receive a pass, they most commonly got the ball with their back to goal. With the immediate pressure of a man-marker, they lacked the ability to turn towards goal which limited their options significantly and usually they resorted to a pass back to their teammate. In the moments where they could turn, usually due to a slow reaction from the man-marker or the ’10’ dropping slightly further deep, Liverpool looked quite threatening and the combinations between the front ‘3’ carried some potential. Rotation between Lallana and Origi to allow the Belgian to receive between the man-marking Wanyama and Clasie. 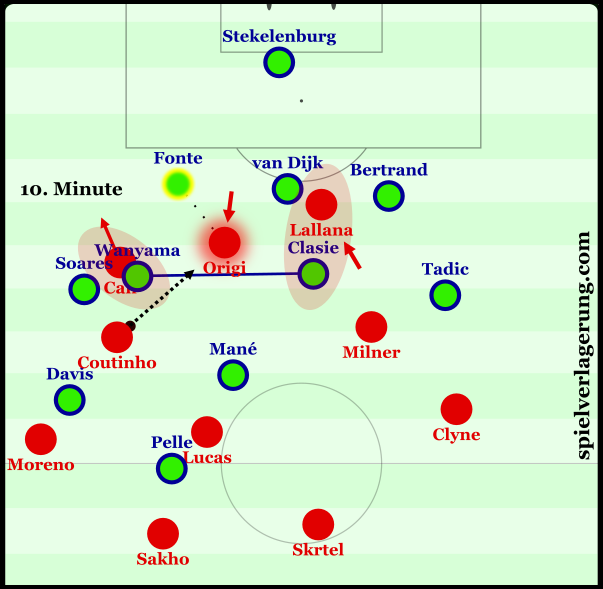 Although the Origi – Lallana – Coutinho attack lasted for only the first 45 minutes, it demonstrated some potential for success with effective rotational movements. Origi quite frequently dropped off of the defensive line whilst a ’10’ would move higher up so that the Belgian could move free in a deeper position. Through doing so, they worked well against Southampton’s man-marking scheme which generally was too strict to deal with local rotations. As you can see in the diagram on the right, Wanyama and Clasie have become disconnected due to their man-marking as they follow the aggressive movements of Can and Lallana respectively. By stretching the two central midfielders whilst putting pressure on both centre-backs, Liverpool opened space for Origi to drop in without a marker. At half-time, Klopp replaced Origi with Cristian Benteke as Liverpool moved to a more aggressive possession game. James Milner took on a more advanced role whilst Can formed more of a standard double ‘6’ with Lucas. The result was a shape closer to a 4-2-3-1 though slight asymmetry was evident across the midfield through both the positions and orientations. Initially, the build-up suffered to some degree as it missed the supporting movements of the ball-near CM, especially down the right as Can was still able to offer through the left. 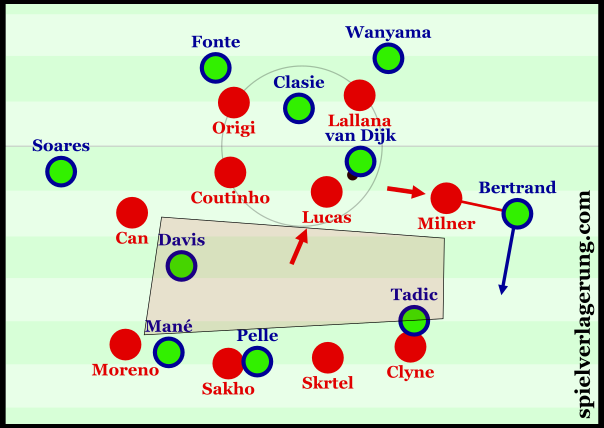 Klopp quickly made an adaptation however as he allowed Lucas to start dropping between the centre-backs which created a situational back 3. Klopp’s changes through the second half. With three attacking midfielders behind the striker now, Liverpool benefited from a slightly more aggressive structure with similar degrees of variability in the movements. The previous orientations were still relevant as Milner was more supportive yet the English midfield now had the freedom to make runs forwards and could be seen on the same line as Benteke at times. After introducing Roberto Firmino for Lallana, Liverpool changed shape again and reverted to one closer to the original 4-3-2-1. The midfield was very flexible as they looked to find the opening goal of what was a tightly contested match. Many variable movements could be seen between Can, Milner, Lallana and Coutinho whilst Lucas took on a more static role as he had throughout the match so far. To the Brazilian’s left, Can made vertical movements upfield much more frequently as opposed to his role in the 4-2-3-1 whilst Lucas made deeper balancing movements to support the structure. On the opposite side, Milner was more oriented to a wider role and exclusively acted in the right half-space and flank, positioning himself as the situation demanded. This was often in accordance with the movements of Clyne and can be seen in the scene where he crossed for Benteke’s goal from a deep half-space position. It was interesting to see a supportive role for Firmino as the attacking midfielder. The new-signing made constant dropping movements during Liverpool’s build-up stage and he received passes in deep positions on a common basis. He was quite important in accelerating the development of their possession which was important given the stage of the game. After Benteke put the home side ahead in the 77th minute, Klopp quickly reverted back to a 4-3-2-1 in an attempt to find more stability to protect the lead. The above 4-1-2-1-2 was based around aggressive movements from the midfield (bar Lucas) and would’ve been a risky shape to protect a 1-0 lead because of that. The only other adaption in shape was when Ibe came on for Lallana in the 83rd. Firmino moved into right central-midfield, Milner to right-midfield and Ibe slotted in on the left to create a basic 4-5-1 formation. After Mané equalised, Firmino started to take a more aggressive positioning between an 8 and a 10 with the expected forward movements of the wide players and Can to some extent. Klopp is still looking for his first win as Liverpool manager but will be able to take multiple positives out of the match. 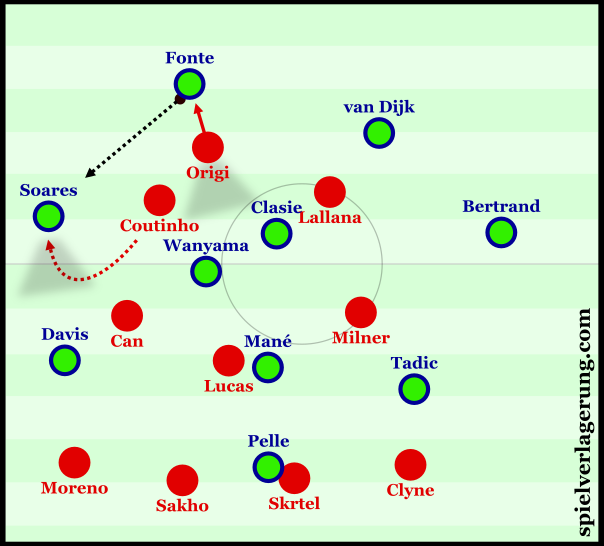 Liverpool adapted their shape on a number of occasions throughout the second half yet there wasn’t many negative consequences in features such as their synergy across different formations. The introduction of Benteke was important despite Origi putting in a competent performance whilst their pressing was improved. On the other hand, there are still some underlying issues. A major one being the orientation of the players being very much reactive to the opposition’s actions. It will be a big task for Klopp, Buvac and co. to develop a more proactive process in the decision making of both the individuals and the collective as a whole. Didn’t notice Lucas dropping in between Skrtel/Sakho, which is quite interesting actually. Klopp prefers him moving around the space in front of his centre backs rather than collecting the ball from deep. wow awesome analysis. Keep it up. Phenomenal articles. Very enjoyable reads despite the large amount of information. This is helping me to understand Klopp’s fundamental ideas for Liverpool which seem to be more about quality position football, rather than countering with pace than most realized.